Caring for your hand knitted and crocheted items is as important a step as making them. Handmade items can become treasured heirlooms and last for many years with the proper care. Once a project is complete, it is always a good idea to keep the care instructions from your yarn labels or to write them down in a notebook kept for that purpose. It is also handy to roll up a little ball of each of the yarns that was used, label them, and keep them in a safe place. That way, you will be prepared to mend minor pulls or unraveling in the future. If you are giving the item as a gift, a cute idea is to make your own care tag (you can print some of these free printable care gift tags here) and attach it to the item so the recipient will know how to properly care for it. You can attach the tag with some of the yarn that was used for the project in case it is needed for repairs. If buttons were used for the project, it is also a smart idea to attach an extra button to the inside of the item that can be used as a replacement. Improper storage and laundering are the most common causes of damage to crocheted and knitted items and often result in the item being ruined. The following tips can greatly extend the life of your item. Unused knitted or crocheted items should be cleaned and stored in closed plastic bags to keep them clean and free of dust. Never store them with items that contain zippers or buttons that can cause damage. To prevent unwanted pests, items can be stored with cedar balls or dried herbs such as lavender and sage. Essential oils are also a natural way of repelling moths. Just a few drops of cedarwood, clove, rosemary, lavender, or sage will do the trick. If you are using Eucalan detergent to wash your items, try the one scented with eucalyptus oil, which is a natural moth and flea inhibitor (my mom sells essential oils here if you are interested in trying some out). An import factor in caring for your hand knitted and crocheted items is laundering. 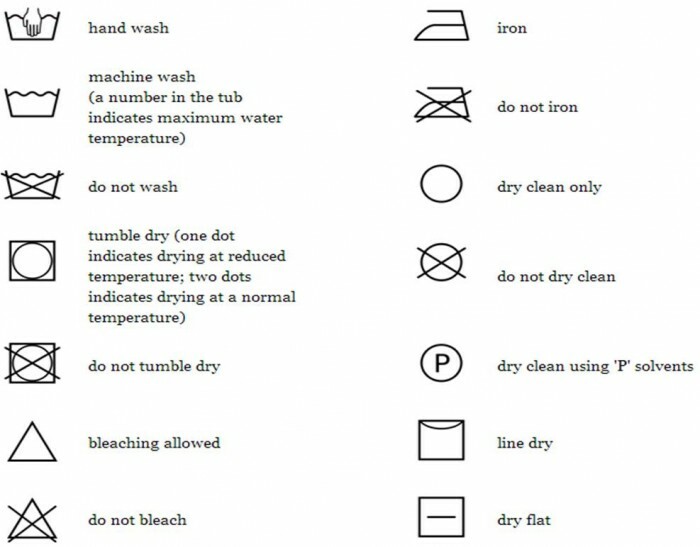 Make sure to check yarn labels for laundering instructions (see below for a list of commonly used symbols and their meanings). There are plenty of washable yarns available, including acrylics, superwash wool, and cotton, which can usually be washed on a gentle cycle in the washing machine in warm or cold water. Most wool items should only be hand washed, in cold water, because the agitation from a washing machine can cause their fibers to bind together, or felt, causing items to shrink. Some wool yarns, called superwash wool, have been specially processed to prevent felting. Laundry detergents are usually too harsh to use on natural fibers. Always choose a liquid soap, such as Ivory dish detergent, or a mild baby shampoo. A detergent-free cleaner can also be used. Specialty wool and fabric washes such as Kookaburra Wash or Soak are ideal, but make sure the product does not contain optical brighteners, which can fade yarn colors; and never use chlorine bleach. Specialty detergents that contain lanolin, such as Eucalan, are also great. Lanolin actually helps to naturally condition wool fibers, decrease static, and increase the water resistance of wool, therefore being especially beneficial for garments used as outerwear. After washing, rinse the item thoroughly in cool water. Never twist or wring out. The best way to dry the item is to roll it up in a towel for a couple of minutes. Then, unroll the towel and lay the item on a new, dry towel. Reshape the item gently, smoothing out any wrinkles, and leave on the towel to air dry. It is not a good idea to hang a knitted item to dry because items can stretch considerably when wet. If you don’t know what type of yarn was used, it is safest to have the item dry-cleaned. Love all your tips and tricks…thank you for sharing! Great tips. Thank you for linking to Totally Tutorial Tuesdays. I have been told never put clothing in plastic because it can’t breath and it can damage the material .So I just put my sweaters in my dresser drawer. Your information is so helpful, Thank-you. From; Fran. I have two crochet items (ones a bedspread and a table cloth)that were made back in 1917, by my great-grandmother. They have been stored in boxes wrapped with tissue paper. I would like to store them so I’m be able to pass them down to my children or grandchildren. I found this under caring for crocheted items and I also have a bedspread and table cloth that was made years ago by my mother-in-law and I want to save it. I’ve had it wrapped in tissue and stored in a cardboard box which is pretty torn up. What kind of box (plastic or ???) to store them in.